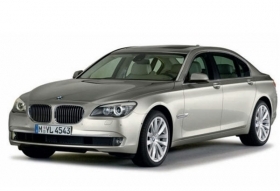 Demand for the 7 series is helping to boost BMW. Dusseldorf (Bloomberg) -- BMW AG said sales rose 15 percent in April as the top-end 7-series sedan and Z4 roadster won customers. The maker of BMW, Mini and Rolls-Royce models sold 116,391 cars and sport-utility vehicles in April compared with 101,591 a year earlier, the Munich-based company said today in a statement. Four-month deliveries jumped 14 percent to 432,037. BMW remains “confident for the next months” as a revamped 5-series sedan and the new four-door Mini Countryman car win buyers and the company's main sales regions recover from the recession, sales chief Ian Robertson said in the statement. The German manufacturer is seeking to raise profitability as Daimler AG's Mercedes-Benz brand and Volkswagen AG's Audi luxury division step up efforts to take market share. BMW will “significantly” surpass a goal of cutting spending on components and supplies by 4 billion euros ($5.2 billion) by 2012, Herbert Diess, the head of purchasing, said on May 5. Sales by the main BMW brand increased 17 percent to 98,494 cars and SUVs, with deliveries of the Z4 surging sixfold and demand for the 7-series gaining 62 percent. The Rolls-Royce Motor Cars division's sales more than tripled to 179 cars, boosted by the introduction of the new Ghost model in December, BMW said. Mini sales rose 2.3 percent to 17,718 vehicles. Deliveries in Europe increased 3.8 percent last month to 64,583 cars and SUVs, with BMW's German home market posting a 7.1 percent gain, the company said. U.S. sales rose 9 percent to 21,111 vehicles. Sales more than doubled in Brazil, where deliveries jumped to 816 from 331 a year earlier, and in China, where sales surged to 12,440 units from 5,789.